Bred for: conformation, movement, size, substance, and a gentle temperament - the sky's the limit with this gifted youngster. 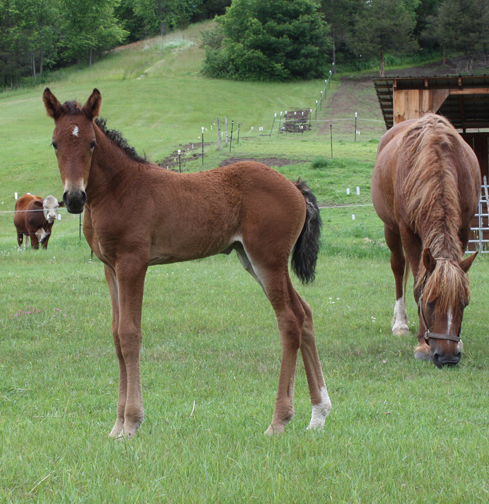 This eye catching 2007 dark honey dun American Bashkir gelding out of Col's Buffalo Girl and Col's Ace of Diamonds, CSI S05528-07, is 16.1 hh, and has feral markings including: barring on his legs, dorsal stripe, and black points. 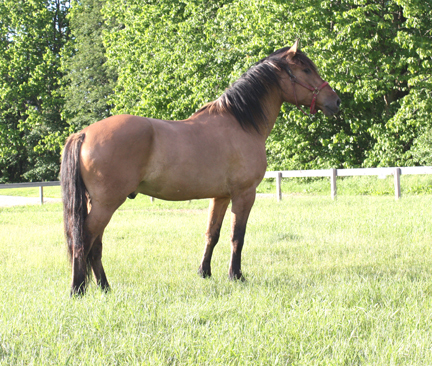 His coat is straight, with a very full bi-colored mane and curly bi-colored tail. With his uphill, balanced movement, Apollo is an outstanding competitive Dressage or Eventing prospect; and a level headed, family member for the rider seeking a hardy, eye catching, and personable barefoot athlete. Apollo has a lovely big trot, and a wonderfully cadenced slow rolling canter. 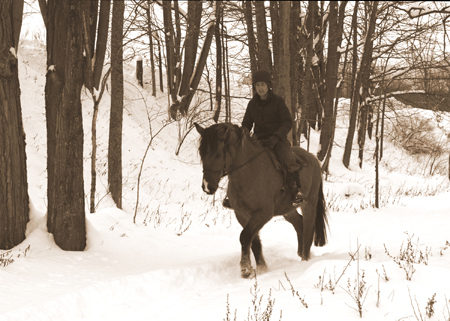 He is working under saddle: walk, trot, canter, leg yield, shoulder-in; cavaletti; playing in informal drill sessions; is out on rugged trails of varied terrain (including water crossings and low natural obstacles); and has started work over low crossrails and haunches-in... 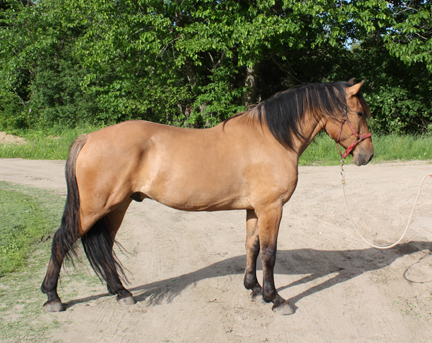 He can also be ridden bitless with a halter and lead rope. 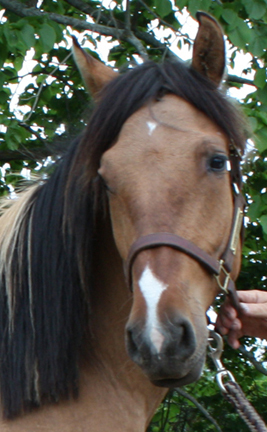 Continuing with his education, Apollo can: ride the trails on Friday.... and compete in the dressage arena on Saturday. He will shine in competition with a knowledgeable rider/ trainer. We would like him to go to a loving home where he can continue with his schooling; he is a kind youngster with many productive years ahead. 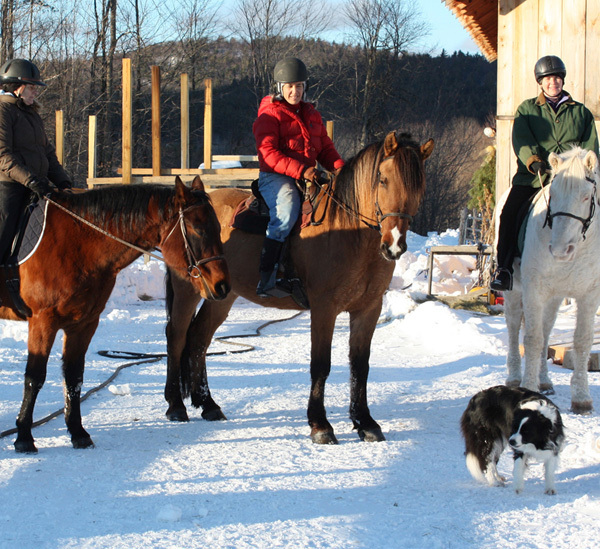 SOLD-- We are very pleased to have Apollo living at a wonderful dressage AND Animal Rescue barn in NY...... where he is loved by Rosa and her trainer. We are happy to offer off season savings to our buyers. 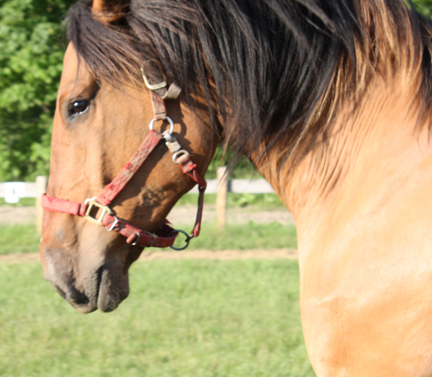 Call the farm for more information if you are interested in one of our sporthorses.